The National Athletic Trainers’ Association provides a network of over 43,000 member athletic trainers around the world with various resources, continuing education, and career services. Additionally, NATA is an advocate of professional regulation and safe sports. Drupal 6 site was no longer supported and needed a migration to Drupal 7. Website had a dated appearance and was not mobile responsive. Poor UX reduced the trust-building experience. Multiple logins were required for members to access members-only content stored in a separate database with a different programming language. Great content, however, cluttered, disorganized, and poor navigation, made it difficult for users to find information. LevelTen implemented a complete site redesign, rebuild, and migration to create a structurally sound, scalable website where NATA can more effectively manage their content. INFRASTRUCTURE OVERHAUL with stronger navigation for a simpler, more intuitive user experience. MIGRATION TO DRUPAL 7 and total redesign of the site to be modern, user-friendly, engaging, and responsive. EASILY UPDATE CONTENT by creating access controls to give departments ownership of their respective sections of the website, providing structure, and keeping content easily searchable. CATEGORIZED INFORMATION with new content types that can easily be filtered and tagged. ARCHITECT A UNIQUE INTEGRATION which provided a centralized SSO (single sign-on) allowing communication to the members-only database. The complete infrastructure overhaul and a stronger navigation for a simpler and more intuitive user experience, resulted in NATA’s bounce rate to decrease by 26.19%. Additionally, page views per visit increased by 24.06% and users are viewing more pages per visit in the first 6-months since the launch of the website. Through collaboration, LevelTen and NATA were able to create a website that members could now effectively navigate and communicate like never before. Our particular project was huge in scope and had a lot of challenges, but LevelTen never flinched and always found solutions to help us keep the project moving forward. 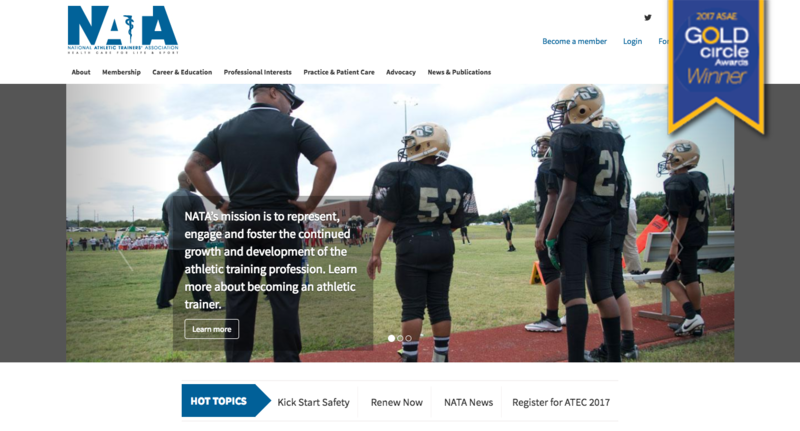 Nice work @NATA1950 on the new website design! Have a complex website? Let us help you.